The 2004 Harley Davidson Ultra Classic for sale has a Screaming Eagle Stage One upgrade, new seals, new motorcycle battery room and rear tire. The lovely 2004 Harley Ultra Classic has the classic pearl white paint color, many extra accessories and abundant amounts of chrome. The 2004 Ultra Classic has had a complete service and currently has 50k highway miles. 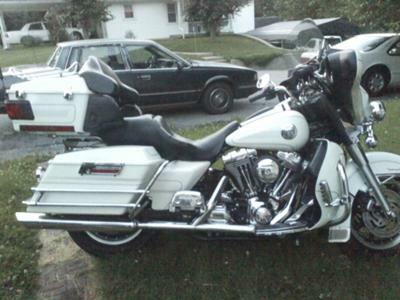 The Harley for sale is located in Dickson Tennessee and I am asking $12,500 or will consider a trade for a comparable HD Street Glide. If you have a motorcycle that you would like to trade or would like to make an offer please leave your questions and contact information in the space below provided by Strike Lightning Used Harleys for Sale and the owner will get back with you as soon as possible. Strike Lightning would also encourage bikers to submit a review of the 2004 Harley Davidson Ultra Classic for sale to help potential buyers make informed decisions and to benefit the biker community as a whole.